Whether you are a seasoned veteran at your work or deciding what field you’d like to pursue, the prospect of job security looms us all. Choosing a sustainable career in a field with prospective job growth and opportunity is vital to ensuring the stability of your income. 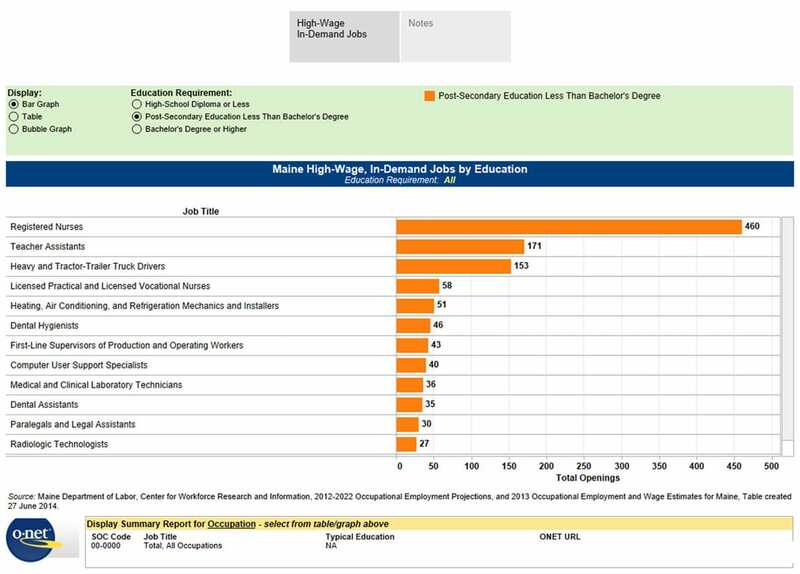 Maine’s department of Labor has compiled a list of the top “High-wage, In-Demand Jobs in Maine” classified by education. In this graph (click here) you’ll see high demand careers which require less than a bachelor’s degree. Many of these careers can be obtained through fast paced and accredited post-secondary education schools. Though a Registered Nurse is categorized under “Post-Secondary Education Less Than Bachelor’s Degree” according to the Maine State Board of Nursing, half of the programs in Maine are Bachelor’s degree programs while the ladder half are associate degree programs. While associate degree programs are right for some individuals, those who are looking to enter the work force in less than 2-3 years will choose more trade oriented career programs to achieve their career goals. Some of the top Technical Trade careers include Heavy and Tractor-Trailer Truck Drivers (CDL Drivers), Heating, Air-Conditioning, and Refrigeration Mechanics and Installers (HVAC Technicians), and Medical and Clinical Laboratory Technicians (such as Medical Assistants, Medical Laboratory Assistants and Phlebotomists). If you’re considering a career which has potential to grow as well as job security in the state of Maine, yet cannot commit to the length of an Associate Degree or Bachelor Degree Program, consider a trade school that has the potential to achieve your career goals yet train you to enter the work force in a relatively short amount of time. To see if a trade school in one of these high demand industries is right for you, take this fun and free job personality assessment.